What is arguably the most innovative electronics system in recent times debuted at the Miami boat show and very few people noticed! 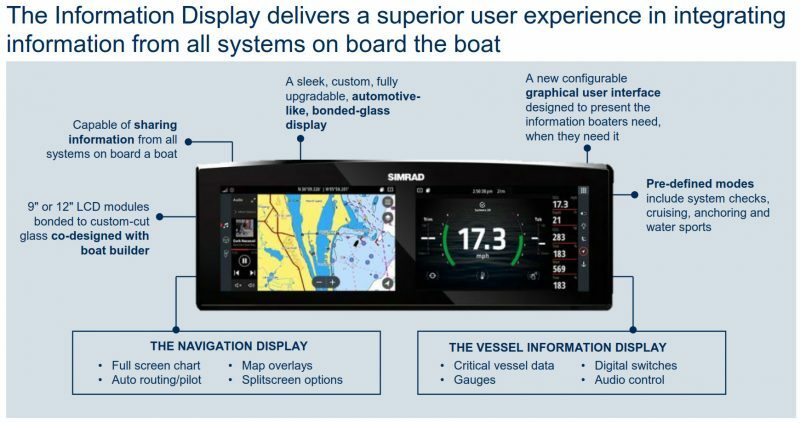 I’m talking specifically about the Navico Information Display that was purportedly integrated into the dashboards of some 14 new boats around the show, but there may well have been similar new integrations going on that even an obsessive marine electronics journalist is not aware of. 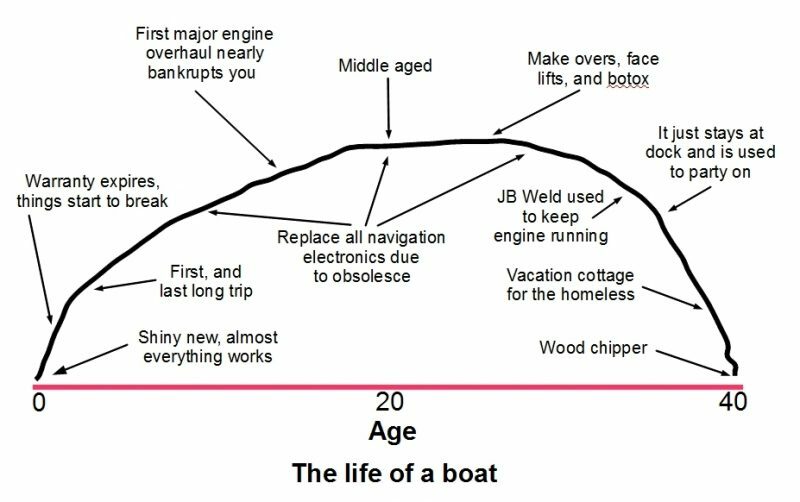 While the phrase “new paradigm” seems overused and often misunderstood, I think we’re looking at the real deal as the familiar model of how boat electronics are developed and marketed submerges behind the hard work of boatbuilders trying to produce new models as easy and fun to use as modern automobiles. And while adopting any true new paradigm can be difficult, this one is especially challenging because core to the whole concept is that the electronics simply become part of the whole boat experience. If you like knowing your boat’s systems well, perhaps selecting and even installing your own electronics, don’t worry. The old model — with multiple electronics brands competing to explain and sell their gear directly to boaters — isn’t going away any time soon. But if you’re also attracted to the new everything-integrated vessels — or are in the business of selling or servicing such boats — it’s going to take some extra effort to understand what’s going on behind the screens. And we’re only beginning to glimpse what’s possible. There was a Navico ID press release last October and I did see the prototype I anticipated at METS. 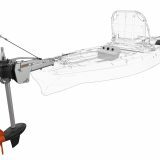 But by its very nature you can’t really see what ID can do until it’s installed, and it’s going to vary a lot from boat model to model. Fortunately Ben Stein will be reporting here soon about the hand’s on Information Display experience he managed to finagle in Miami, and that’s especially fortunate because I’ve been amazed by how little I could learn from Maine even though I knew the game was changing. 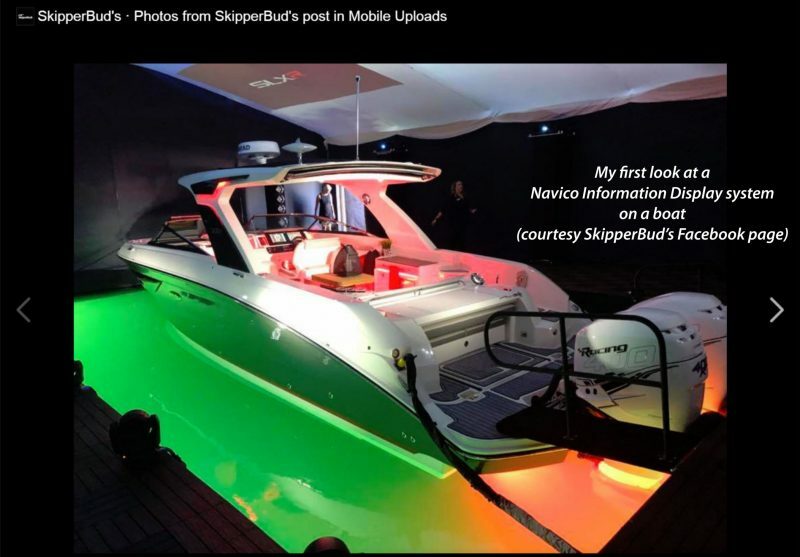 In fact, my first look at an ID system installed was that SkipperBud’s Facebook photo at top, and only because I already knew that the new Sea Ray had ID. Meanwhile, coverage of the elaborate 350 SLX-R press event typically had so much ground to cover that ID was reduced to “and 12-inch touchscreen display” in this otherwise illuminating Soundings Trade Only article. 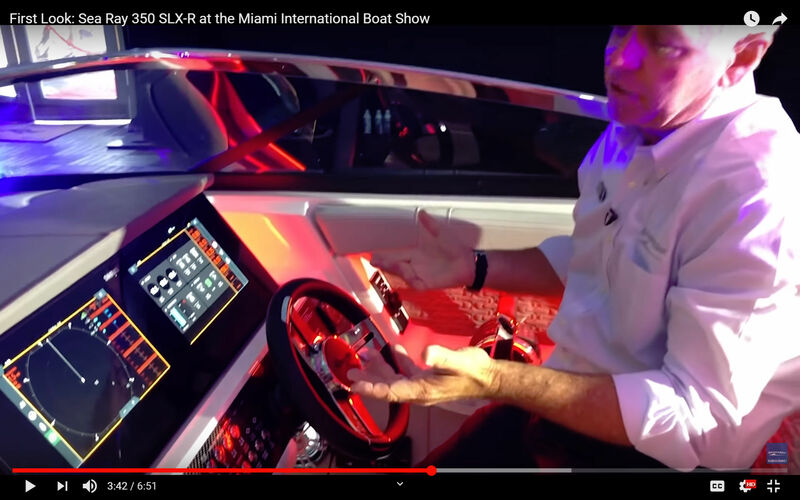 Now Sea Ray did put out an SLX-R press release which mentions how “Technology highlights include an exclusive helm display with intuitive SelectResponse 12-inch glass displays and state-of-the-art systems from Simrad…” and you can somewhat deduce what SelectResponse is from this SLX-R First Look video by MarineMax. But, wow, what about digital switching, off boat monitoring, and all the other ways the ID system may be involved with this boat? The paradigm shift is even more glaring when I picture the highly detailed presentation of ID that Navico would have made in Miami if it could. Actually, I know just the guy to lead it. You’d think Ottosson would feel frustrated not being able to fully market a technology he calls “more revolutionary than anything we’ve done in the last 10 years” to end users but, if so, it’s masked by his enthusiasm about working behind the scenes with builders and system manufacturers. And while yours truly is a bit frustrated by interesting off-the-record information, I’ve also learned to peruse what Navico has made public about ID with great care. 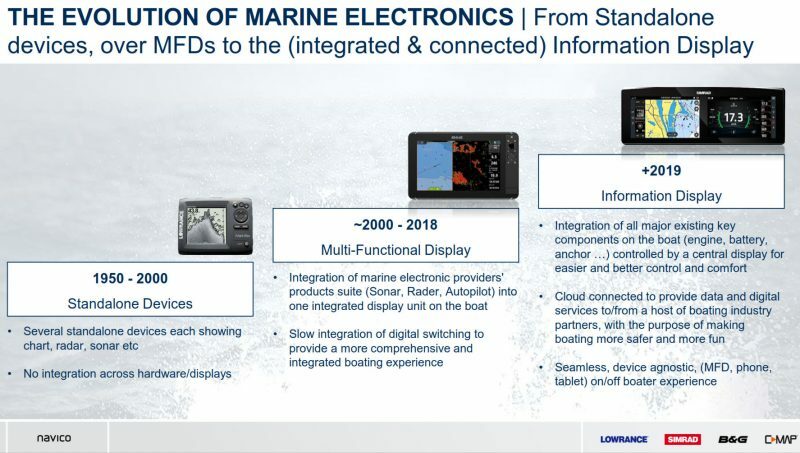 For instance, “Integration of all major existing key components on the boat” is extremely ambitious, but then again this slide is an overview of what Information Displays will do in 2019 and beyond. So while Ben Stein will deliver more detail on what components various IDs around the show were actually talking to, the goal is all. Similarly, “Cloud connected to provide data and digital services to/from a host of boating industry partners” conjures head spinning possibilities, especially when “all key components” are involved. But it’s possible that even a Panbo Ben in Miami couldn’t find out how connected the initial ID systems will be. Finally, consider what a “Seamless, device agnostic (MFD, phone, tablet) on/off boater experience” may mean. A common operating system, or at least a common browser? 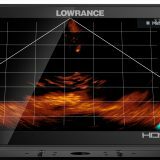 And does that imply that current and/or next generation Simrad, B&G, and Lowrance MFDs will get a significantly new interface? I think that what Sea Ray is calling “intuitive SelectResponse” is labeled “Pre-defined Modes” on this generic ID slide, and I gather that they can change automatically according to how the boat is being used, at least to some extent. That could very helpful, if done well, and I know that Ben Stein will have more detail. But let’s note that some ID features may have different names on different boats, or maybe they will sometimes actually be different, and whatever the case, it will be the boatbuilder’s job to explain. That’s the new deal. 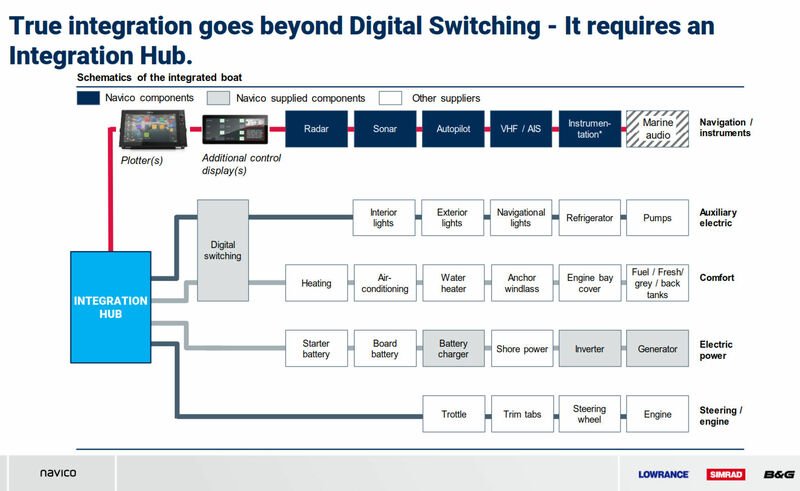 I first saw a draft of this slide at an interesting 2017 Navico press event but now there’s more emphasis on the Integration Hub as the concept becomes an actual hardware/software system. 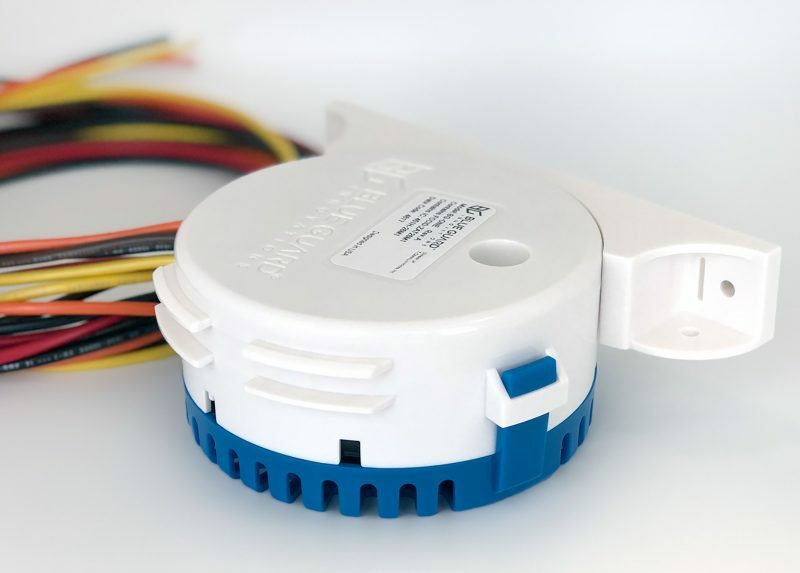 I will add that true integration also goes beyond NMEA 2000 and Ethernet; if all boat components that can integrate is the goal, many protocols are involved. Ben Stein will have detail on the actual hub and protocols, but I found another way to peek behind the ID technology in the meantime. 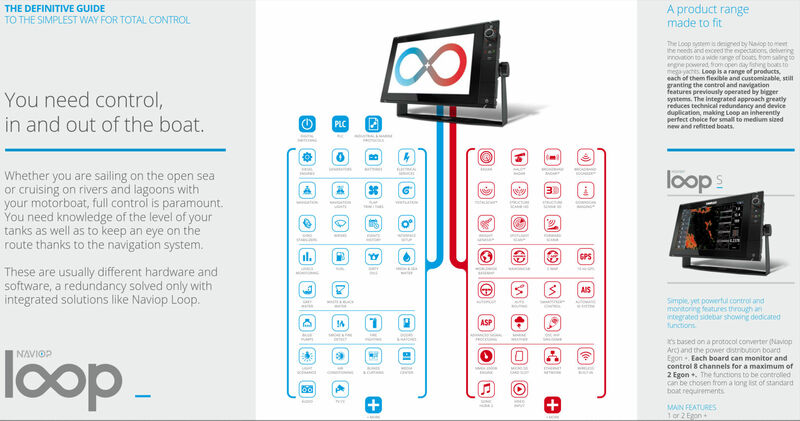 Though Navico acquired Naviop in 2017, the latter is still a standalone brand in part, and so available Naviop Loop systems surely suggest what’s being built into Information Displays. Just click the image above larger to see the functions (and protocols) being integrated with more familiar multifunction display features, or better yet, download the Loop brochure. Impressive. 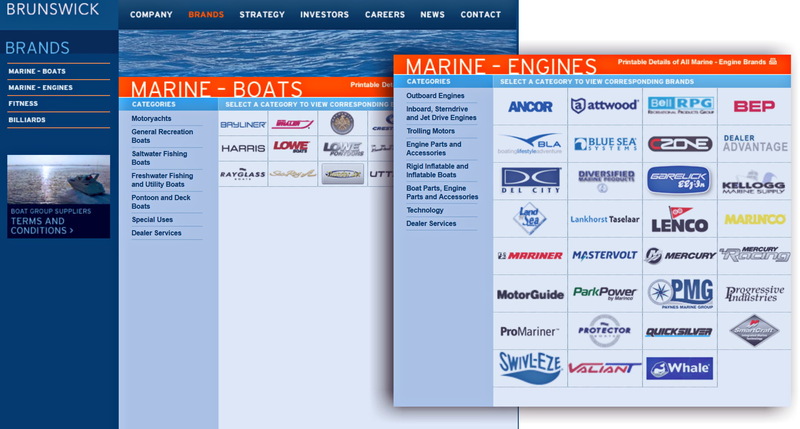 Stepping back a bit further, Brunswick — the conglomerate that already owned Sea Ray, Mercury, and many other marine brands — purchased Power Products last June, and that’s why you now see the likes of CZone and Mastervolt in the engine group. Moreover, in September they appointed Dan Clarkson, already deeply experienced with Mercury system integration, to manage a division called Power Products Integrated Solutions. 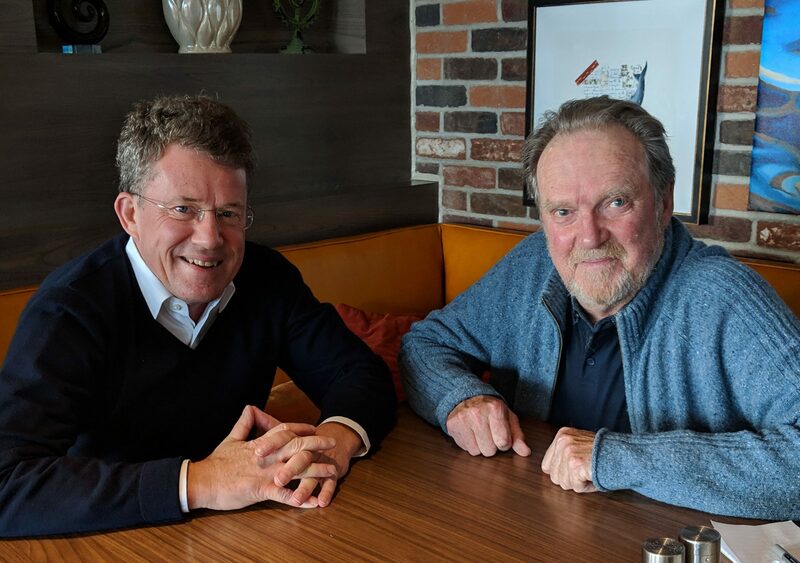 I recommend watching Clarkson’s IBEX Facebook interview with Soundings Trade Only. for more insight into whole boat integration. Note, for instance, his claim that the boater-friendly solutions his division supplies to boatbuilders will not only be agnostic regarding screen displays but also the engines used. I heard similar from Ottosson, which is why Naviop is apparently free to sell outside the ID model, and why Navico often uses information display in lower case. This about a wide open change, not a new brand. Also, we’ve just seen a Brunswick boat with an advanced Raymarine system, and the Sea Ray SLX R mixes Garmin Fusion audio with Simrad ID. 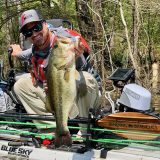 Exclusive relationships do not seem to be part of the new paradigm, and while that may make it even more difficult for inquisitive boaters to understand what’s happening, I think it fosters a healthy mix of competition and collaboration. And that’s good, because whole boat integration is not easy. Many of proponents tend to compare what’s possible to modern cars, and Dan Clarkson even predicts that ten years from now it may be as easy to drive an unfamiliar boat from Miami to New York as you can today with a rental car. Well, I love the “radar” and camera assisted cruise control in my new Toyota RAV4, to be specific. It can safely follow another vehicle down a curvy road, even if it suddenly stops, and adding it as third-party equipment — something I often do on my boat — is inconceivable. But boats are only vaguely like cars, built in much smaller production runs but in many more sizes and for a wider variety of uses in more variable environments. So it’s going to be quite interesting to witness the advent of the new integrated boat paradigm, and I look forward to Ben Stein’s report from the big show. There’s a lot going on behind the screens and behind the scenes.